The primary purpose of this meta snapshot is to capture the most popular and powerful decks on ladder. It will offer insights to the deck’s strategy, matchups and decklists. The decks have been organized into four tiers by top ladder player finishers Karakondzhul and Warriors7. Welcome to the July Meta Snapshot, where we look at how the nerfs have affected the meta. The ladder has quite a lot of diversity, as no deck currently dominates the ladder as opposed to the previous 2 months where it was all Hlaalu and Scout. The nerf to Drain Vitality, Tel-Vos, Manor and Uprising has shaken up the meta as the two most dominating decks on ladder, Scout and Hlaalu, were taken down a notch so other decks can make their comeback. Hlaalu still remains a strong deck, but Scout has fallen to tier 3, as it has lost its main tool against aggro, Drain Vitality. Midrange has seen a comeback, as both Tel-Vos and Drain Vitality were a huge hindrance to the archetype. Conscription and tokens, both decks that look to go wide, have also reemerged due to the nerf to Drain Vitality, although tokens were quite good in the previous meta due to the ability to go under Hlaalu. Last but not least, Tribunal Control greatly benefitted from these nerfs as Scout has taken its downfall. Optimized and adaptable decklists – these decks dominate the high legend ranks. In a vacuum, this is the most powerful deck in game. The only nerf to the deck was Uprising, and it is rather a buff as it makes the combo only require two cards and one condition: having Dark Rebirth and Pathmage in hand while having 13 magicka. It has the capacity to run so many tools versus aggressive decks, while maintaining the ability to simply wait to combo out control decks, if it has not already out valued them through Divayth Experiments and the insane amount of cycle it runs. Even the hard counter card, Hallowed Death Priest, must be drawn in time and be timed perfectly to counter the deck. Nix-Ox has no weak matchups, although aggressive decks are the best way to counter Nix-Ox. It has both board based control tools and spells to deal with threats, so even cards such as Cutlist has problems countering the deck. Against control decks, it has a 90-10 matchup, as the only real way to stop the counter is hoping your opponent lacks the APM to pull it off or somehow screws up the math. Even then, the raw value of the Uprising Combo should overpower most control decks. *If players don’t want the full combo variant or are new to the deck, Paarthurnax or Odahviing, and Ancano/Soul Tear need to be included to win through sheer value. With the nerf of Tel-Vos and Hlaalu, Midgro Warrior is now back to tier 1. It has had much success on both ladder and in tournaments. The archetype offers very strong and efficient board development plays in turns 2-5, so it usually develops a board before the opposing control deck can find the right removal. We’ve seen some versions include catapults to combat the deck’s natural weakness against lower curve decks (i.e. tokens). While most lists used to play Mudcrab Merchant before the nerf, the deck remained largely unaffected by the nerfs while Hlaalu and Scout, 2 of its weaker matchups, were nerfed. Midgro warrior used to be on the top of the meta just a few patches ago and it looks like it’s making a comeback. Midgro warrior is very difficult to control as it usually plays cultist on top of very large minions such as bleakcoast troll or sower of revenge – so it’s usually favoured against any slower or spell-based controllish deck though the deck is somewhat susceptible to lethal minions. Against other midrange decks, it can go either way as the matchup is largely dependent on the ring and individual skill. Warrior’s main weakness is that it doesn’t have any comeback mechanics – so it’s difficult to win games against faster, lower curve decks – such as tokens – as they usually develop a board earlier and take value trades. Although not as strong as decks in tier one, they are still popular and can even find favorable matchups against tier one decks. Genius Pathmage has found its way into many Control Tribunal builds and become a build-around card. On turn 11 Pathmage can be used to summon up to 3 Doppelganger and Ayrenn from your deck. Thanks to Ayrenn’s ability this play can be paired with several removal spells, so that you are not only developing a huge board, but also defending yourself effectively. If a Pathmage survives for a turn, it is a great target for A Night to Remember to pull another big threat from your deck and still having plenty of magicka left for defending yourself or developing more threats. Nix-Ox Telvanni: This is a bad matchup for any control deck, but not unwinnable for Tribunal. Having Genius Pathmage on turn 11 is hard for them to answer, since this play summons creatures that are resilient to Ice Storm. With A Night to Remember in hand, it can be worth playing a Pathmage earlier (e.g. on turn 6 or 5 with the ring of magicka) and summoning up to 3 Doppelganger and Ayrenn on the following turn already. Midgro Warrior: This matchup is slightly favored for the Warrior. A Withered Hand Cultist can completely shut down the Tribunal’s hand full of actions and many threats from Warrior are resilient to the damage-based removal spells from Intelligence. However, a single prophecy can turn things around, Cast into Time is a great answer for Sower of Revenge and with the cheap ward creatures and removal spells as well as guards such as Hive Defender Tribunal can surprisingly often keep up in tempo and control these decks. Ald Velothi Assassin and Vigilant Ancestor can be great tech choices to improve this matchup. The reason why Tribunal is not Tier 1 is that it is unfavored against the other Tier 1 decks (Telvanni and Warrior). Most other matchups are favored for Tribunal or at least even. With the addition of Genius Pathmage, Tribunal now has a power play on turn 11 that is very hard to control and turns around games. In unsettled metas, midrange battlemage is always a safe choice to use to climb the ladder. The Tel-Vos nerf made the deck weaker versus midrange, but the deck was good against midrange prior to the introduction of Tel-Vos. The nerf to Drain Vitality has alleviated its Scout weakness, although the rise of Tribunal certainly hurts the deck, so against the top-tier control decks, it still has a slightly weaker matchup. It has no particularly weak matchup, apart from dedicated-yellow control deck such as control Tribunal. Against midrange, it has enough control tools to lock the game down, despite Tel-Vos’ nerf. Versus conscription or greedy control, it should be able to rush the opponents down, though it is dependent on a proactive draw. Crusader is the best aggressive deck when it comes to resource extension – with tools like crusader’s assault, eastmarch crusader, housecarl and ash berserker, the aggression never stops. While some crusaders choose to be more tokeny and rely on the willpower package with resolute ally to establish an admirable board early, others choose to include more combat mechanics as well as charge minions from the red package and the result is more board-oriented aggressive deck. The nerf to drain vitality certainly helped tokens to find a spot back in the meta. As any other form of tokens, Crusader is punished by decks with ice storm. However, crusader’s natural resource extension means that it has the best chance of coming back on board once it’s been cleared. Crusader is typically favoured against midrange decks as it has a very low curve. It should be noted that crusader relies a lot on establishing a board very early so most of its losses happen when the deck finds all the resource extension cards such as Ash Berserker or Crusader’s Assault but no development plays. With the recent nerf to Manor, Hlaalu has significantly fallen in popularity. However, the archetype is still very strong – just a bit more fair to play against. Manor is now close to a dead card against anything that can apply pressure which means oathman took a hit as well as Manor used to be the most reliable trigger for its effect. Most aggro Hlaalu lists play out similarly to tokens – both archetypes try to develop a very strong early board before overwhelming the opponent’s face. However, hlaalu has access to the best charging minions and it can always surprise with a lot of burst from hand so it’s not as punished by board clears such as ice storm. Hlaalu is one of those decks that has access to so many tools that it can be teched for any matchup. That being said, if you decided to cut manor, you are punished by decks that play ice storm though cultist helps a lot against control. And, if you decided to still include manors on top of cultist, most aggressive lists can get below your curve and win before you had a chance to stabilise. The access to charge as a way to clear or burst your opponent means that Hlaalu is favoured against other midrange decks that don’t have such tools and rely primarily on board development. 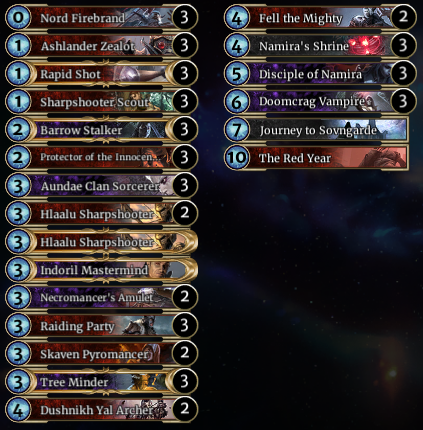 Midrange dagoth is a scary deck that has been doing very well in tournaments and ladder. While it is somewhat negatively affected by the recent nerfs, it used to be too susceptible to drain vitality, so midrange dagoth feels as strong as ever. With high power and drain minions such as Queen Barenziah and Hand of Dagoth, dagoth has tools to combat both aggro and control. Moreover, the combination between blue and red has proven to be very effective in board-based midrange decks as it provides many combat-oriented tools. While people have been experimenting with many different archetypes in dagoth, the midrange version has shown the best results. Midrange dagoth has access to so many drains that aggro/other midrange is usually not a problem to beat – though this was even more true before than tel vos nerf. This is probably the best deck to pick up if you are looking to combat midgro warrior as the combination of a good curve, hand of dagoth and tel vos makes the match very favoured. However, this archetype somewhat struggles against decks with a lot of hard removal – such as control tribunal. It can also lose to faster board-based decks – such as tokens. In a tournament setting, there is no point playing another Telvanni deck apart from Nix-Ox. However, the nerf to Drain Vitality and Uprising has crippled scout, which leaves Conscription the best late game card again. 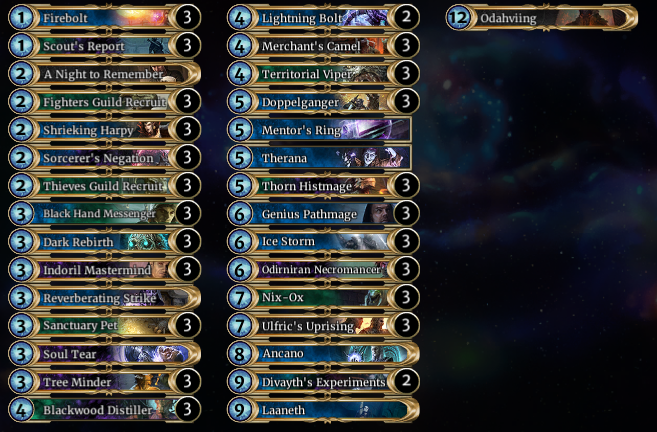 Telvanni is probably the best conscription deck, as it has all the cycle of green, removal of blue, and utility such as draw, ramp and silence from purple. Conscription styled decks are the queen of control, slightly behind Nix-Ox. Telvanni is probably the most consistent variant in terms of control and draw, as it has 5 ways to tutor Conscription as well as ramp. Redoran on the other hand, has a more powerful conscription in terms of burst and board presence, but does not offer draw and is quite reliant on the draw of both Praetorian Commander and Conscription. Average in terms of power level or in need of refinement. Redoran Conscription has evolved from its Doomcrag/Namira variant into a control deck that has the ability to be proactive. Although Redoran doesn’t have green to get draw on its conscription turn, it has Divine Fervor and Praetorian Commander to make its conscription very powerful, often providing 6 or more burst as well as a board that survives ice-storm. Purple offers cycle in the form of Indoril Mastermind and Necromancer, while providing drain in Forerunner and Barrow Stalker. There is also the Necromancer recurring Commander for an even scarier Conscription. It will struggle against control if it does not draw its buff effects, as its conscription doesn’t offer too much Ice-Storm protection or AoE. However if it manages to get 2 buffs, either Fervor or Commander before its conscription, then only Red Year or Breakthrough Rage will win the game. As with most conscription deck, the deck offers many low-cost minions that has the ability to fight for board early on and has plenty of healing option. There is also a plethora of removal thanks to yellow and pings due to the inclusion of red. With scout gone, Doomcrag Warrior has the ability to compete with control decks again. It utilizes cheap minions such as Nord Firebrand, Sharpshooter Scout, Ashlander Zealot to defeat aggro, and these cheap minions can synergize with Disciple of Namira, Namira’s Shrine and Doomcrag for late game value. If Namira’s Shrine isn’t answered, it has the ability to grind conscription and Tribunal (which normally only runs 3 support removals in a 75 deck). Journey is a very powerful win condition, and this is one of the best Journey decks. While the deck is extremely fun and rewarding to play, there are not many favorable matchups, and the deck is not easy to pilot. Against tribunal or conscription, it really depends on Namira’s Shrine or having very good Doomcrag/Namira turns to be able to survive till Journey. Very powerful deck versus aggro, though against midrange it may struggle if it does not draw Doomcrag. Tempo Assassin is a midrange/aggro deck that denies interactivity in the form of shackle (Harpy, Pet), ward and cover (Gloomlurker, Shadowmaster) to be able to push face damage early on so that it can utilize its insane burst potential to finish off the game. Assassin has Cliff Racer, Lightning Bolt, Tazkad and Ancano as burst, with help from Crown Quartermaster and even Royal Sage giving charge. It definitely has the potential to outrace most aggressive decks with its shackle affects, but big guards such as Hive Defender or Brawler can really slow the deck down. Against control, if it does not push face early on, it lacks the resource extension to find enough burst to finish the opponent off. However it can easily burst the opponent once they are at 12 or less hitpoints. Before the July nerfs, Midrange Sorcerer was almost non-existent at a competitive level. Hlaalu was fast enough to undercut Sorcerer, and tenacious enough to outlast it. Popular control decks were able to capitalize on the slower pace of sorcerer compared to other midrange decks, and Tel Vos Magister often shut down midrange as a whole. The nerfs helped re-introduce midrange strategies to the meta, and with Sorcerer being the quintessential midrange deck, it too became viable. The greatest strength of sorcerer is playing resilient creatures that can survive trades. It still has problems with resource extension and protecting itself, however, so successful lists will have to find a way to work around this. Aundae clan sorcerer is a solid card, as it gives both resource extension and defensive tools if one can trigger it consistently enough. Dark Guardian is another card that doesn’t see much play in the meta, but can add to sorcerer’s defense and even provide the occasional card draw off of opponent’s prophecies. Siege catapult is a powerful card that has gained traction in warrior decks, but it fits sorcerer fairly well too, with the abundance of solid blue and purple 1 and 2 drops as well as silence effects. Sorcerer is generally strong against other midrange decks (although not necessarily the major meta ones), and depending on the build, can be decent against control or aggro as well. Midgro warrior is a reasonable but not particularly great matchup. Sorcerer can win the board, but has to utilize harpies and other defensive options to prevent warrior from outracing it. Mid Battlemage has a ton of defensive and offensive flexibility and can leverage these against Mid Sorcerer, but Sorcerer is more consistent in its ability to slam out offensive weapons. Nix Ox Telvanni is probably too slow on average to stop Mid Sorcerer, but if it draws the right tools it can shut it down. Control Tribunal is much the same, but with greater success. Whether Sorcerer lists are playing Black Worm and Odirniran Necromancers affects the matchup. Mono Red and Hlaalu can outrace Mid Sorcerer, and it takes skill and the proper defensive tools to make these matchups favorable. The nerf to Drain Vitality has made the deck very vulnerable to aggressive decks, and the nerf to Uprising hurt the deck even more. It still maintains its insane late game, but without Drain Vitality, its aggro matchup makes the deck much weaker on ladder. Like the sound of screeching rats and building an army of 10/10 vermin? Here is a deck that is viable to legend while achieves this goal. It is an archer deck that has replaced Journey for Skeevers, as Skeevers is definitely more fun to play. Sadly, big rats don’t actually do anything defensively, though Mundus Stone can certainly give them guard, charge or drain versus aggressive decks. Unite is a very unique win condition, able to completely bypass the rune system, Mechanical Heart and even the god himself – Lord Vivec. It is limited by the fact that not only do you need to accumulate 5 different colors via random generating effects, then you would need to either have the magicka or hope opponents don’t remove the extra colors to fulfill the condition. Then don’t forget you need to play the card itself, and squeeze in the 3 magicka to Unite the Houses. Tribunal Unite is also quite powerful, with Pathmage at 13 magicka able to tutor Jarl Balgruuf to offer 4 out of the 5 colors, and leaving 7(8 with ring) magicka left to play an Agility card and Unite the Houses. This means the only random effect needed is to find a 4(5or less) magicka Agility card is needed to fulfill the condition. While most dwemer rely on Halls of Dwemer to be competitively viable, some dwemers have really powerful abilities, such as Yagrum, Steam Constructor being a 2 mana 3/3, Ally drawing cards etc. There are many cards that also benefit from Neutral synergies, such as Shalk and Kagouti Fabricant, and combined with Fifth Legion Trainer, Dwemers prove to be very effective in a mage shell. Unpopular decks, but it is important to include #1 finish decks. Although he did not use this deck to finish #1, he used it to climb top 10. Although it does not have the burst potential of red or have access to Ash Berserker, purple offers resiliency in the form of Catapult, Haunting Spirit and the token lategame monster – Bone Colossus. An archetype under exploration, there are a few top 100 players who have given their own spin on the deck. However due to the lack of popularity, it was hard to justify putting it in a tier.